This entry was posted in Fighting Fantasy and tagged 12 Days of UK OSR by Newt. Bookmark the permalink. I was a bit “why do I need this product” about the new AFF until I bought it on a whim and I’m really glad I did. 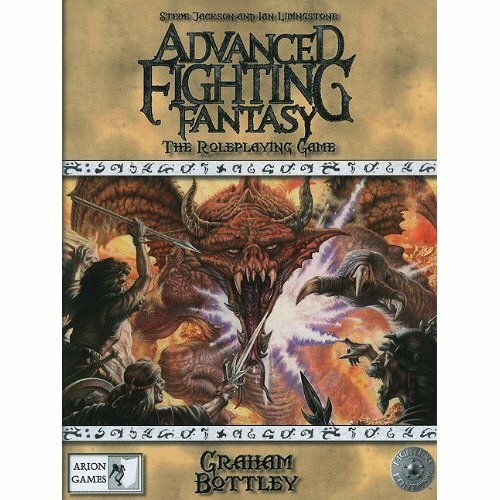 It’s an excellent book and I can’t disagree with any of the design changes and that’s coming from somebody who never saw the point of AFF in the late 80s/early 90s when we already had FF for really simple stuff and Red Box D&D for anything a bit more involved. I played Advanced Fighting Fantasy when it first came out, and our group were very impressed with it. I don’t now remember details, but it was simple enough to use first time with no thumbing through manuals at the table, and flexible enough to cope with all the generic-fantasy based things we wanted to do with it. Considering that RQ was our default system, that’s saying a lot. I just scored cheap copies of the first two AFF2 books (the rules, and monster books). Haven’t received them yet, but am looking forward to delving into them when they arrive. My friend Brian was quite complimentary to the game when it came out a year or two ago, but I was so mired down in fantasy RPGs at the time, I decided to give it a pass. Newt, out of curiosity, how do you think it compares to “Dragon Warriors”? I really like the ‘new-ish’ version of that game.